The Seventh Annual Midwest Undergraduate Data Analytics Competition (MUDAC) and Job Fair was held April 7-8 at Winona State University. I was privileged to participate with a team of judges comparing and grading the various solutions to a research problem posed by the Minnesota Wild NHL Hockey Team, a co-sponsor of the event. 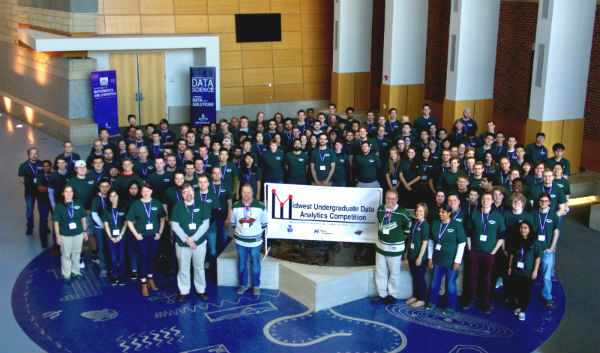 MUDAC 2018 was a collaborative effort between Winona State University (WSU), MinneAnalytics and the Wild. Past Sponsors include Fastenal, Medtronic, Optum, Microsoft, St Thomas, U of M, Jmp, R Studio and Tableau. Each spring, the MUDAC competition is dedicated to enhancing the education of senior-level undergraduates who will soon be entering the data analytics profession. MUDAC allows participants to showcase their analytical talent and promote professional development in Data Science and Analytics. The exposure to real-world business data provided by the sponsoring company provides a truly unique opportunity for the students to explore the challenges they may face after graduation. Co-developers of MUDAC and leaders of this year’s event were WSU Math/Stats Professors, Brant Deppa and Chris Malone. This event brought together undergraduates from many colleges and universities around the Midwest. This year, the competition included 150 students, academic advisors, working professionals and volunteers from our profession. The students, who were in 36 separate teams, spent 24 continuous hours understanding and solving a challenging data analytics problem that was provided by the Wild and defined by Professor Deppa. On day two of the event, members of the judging team witnessed formal presentations by each team and graded them based on five factors, including prediction accuracy and correct selection of statistical methodology. After two rounds of competition, the winning teams were selected and awarded prizes. First place went to a team from Winona State University, second place went to a team from UW – Eau Claire and Best Predication Accuracy went to a team from Cornell College, IA. It was an inspiring experience at all levels and certainly great fun for all. I encourage sponsors, data science professionals, and recruiters to participate in future MUDAC events. Next year, the 8th annual MUDAC event will be held for the first time at Mankato State University. Watch for the announcements.